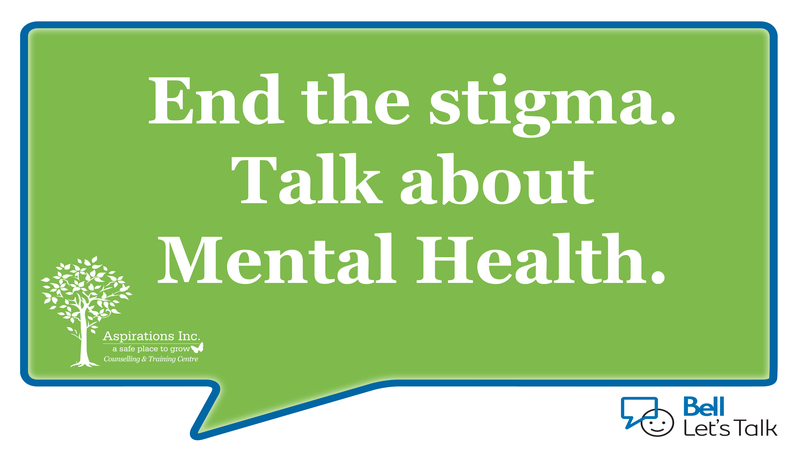 One in five Canadians will experience a form of mental illness in their life. The stigma around mental illness needs to be addressed. 1/5th of our population is or will suffer and they shouldn’t have to suffer alone or in fear. Today is Bell Let’s Talk day. Since 2011, this initiative has raised $93.4 million towards mental health initiatives and has supported 1,208,040 individuals with access to mental health care. This blog is here to help diminish the stigmas around mental health and participate in a larger program to truly help Canadians. Follow the key steps below to get engaged and then head to our social media pages (Facebook and Instagram) to join the conversation. Learn about mental health problems and how they affect people in our communities. Mental illnesses can take on many forms, just as physical illnesses do. The fear and stigma around these illnesses will disappear as people learn. Even the language you use can be harmful to a person’s state. Rather than referring to some as “schizo,” try saying “person with schizophrenia.” There are many Canadian resources available. Check out the resources listed below to begin your better-understanding journey. If you’ve ever experienced mental illness, share your story. Being open and honest about your journey encourages others to speak up. The more we speak up, the less shame is placed on mental illness and can really turn how someone thinks of these illnesses. It could even be as simple as opening a conversation, allowing a friend to no longer suffer alone. Or perhaps you start a wider conversation. Ask your family engaging questions or start a conversation by stating facts you learned while educating yourself. These conversations can be as small as one-on-one interactions, or as large as a facilitated group. There’s no limits to who or how you talk about mental illness. Spread the word to end the stigma. Simple acts like simply smiling or talking to someone are subtle cues to open the conversation and share. Simply listening to someone’s story can be very helpful in you understanding, and them feeling supported. Phrases such as “it’s a phase” or “just relax” can be more hurtful than helpful. Offer your support instead, by asking what you can do to help. Show compassion for yourself as well. It’s easy to be forward and open for the sake of others. Applying negative beliefs to your own self is a harmful and common self-stigma. Sharing your story can help you see your own internalized doubts. The stigma around mental illness has created this idea of “therapy means I’m crazy'” which in turn leads to self-stigma and doubt, and the lack of help and attention required to help. Our therapists provide a non-judgemental, safe space for you to talk. We strive to take care of you and help you grow. It’s okay to be scared! It’s okay to need help! We’re here for you. Use our easy to use Book Now form to get in touch with a therapist today. Each time you watch our Bell Let’s Talk Day video on Twitter or tweet using #BellLetsTalk, Bell will donate 5¢ towards mental health initiatives. Each time you watch our Bell Let’s Talk Day video on Instagram, Bell will donate 5¢ towards mental health initiatives. Each time you watch our Bell Let’s Talk Day video on Facebook or use the Bell Let’s Talk Facebook frame, Bell will donate 5¢ towards mental health initiatives. Each time you watch our Bell Let’s Talk Day video on Snapchat or send a snap using the Bell Let’s Talk filter, Bell will donate 5¢ towards mental health initiatives. Here at Aspirations Inc, we proudly support this initiative. Ending the stigma, and encouraging conversations has been a part of our values from the very beginning. Take action today, and in the days to come. Contribute today in any of the above methods, and make an effort in the days to come to be more conscious of others and to start conversations. One day at a time, one person at a time, we can overcome this and enable everyone to feel safe and seek the help they need.